My granddaughter lost her first baby tooth this past week. Such a growing-up milestone! When your my age, losing a tooth would be a growing-OLD milestone. Not one that I want to experience anytime soon. 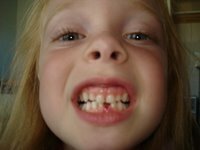 The new lost tooth, however, does represent a growth process in the physical development of a young child. It might be nice if cognitive and emotional growth developmental milestones gave us a physical reminder of what to do, also. Unfortunately, when a child does not recognize the letters of the alphabet, the adult needs to diagnose where she is functioning to determine what activity would help her develop that skill. Many early childhood teachers have not been equipped with the skills to do a proper diagnosis. Think of how much training a doctor requires to be able to diagnose an illness or a physical developmental stage. As impractical as it sounds, it might be nice if teachers of young children had a similar intensive training as they are charged with the emotional, cognitive and mental health of a child. 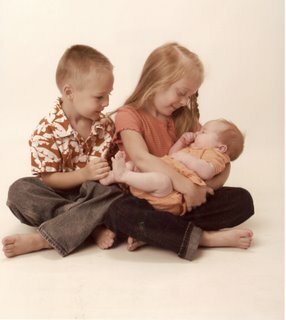 My California grandchildren were in town this past week. I was lucky enough to get to babysit my 2 month-old granddaughter and my 3 1/2 year-old grandson while my daughter and kindergarten granddaughter got their hair cut. We had a great afternoon. While the baby slept, my grandson and I made cupcakes to surprise the other family members. We made a big mess, but we ended up with yummy cupcakes and eventually a clean kitchen. This experience reminded me that sometimes it is messy to give children life-learning experiences. Adults who refuse to make messes are probably not doing what is best for children. I used to get raised eyebrows occasionally for now wearing dress clothing when I was teaching kindergarten. I found that if I wore nice jeans, I didn't hesitate to get out the paints and get on the floor with the children. Raising resilient children is a messy job sometimes. Get your hands dirty! I know that there is a national club that has BPOE all over their facilities. I was always told that the acronym stood for "Best People on Earth." I actually think that the best people on early are early childhood teachers. I just met and worked with a group of preschool teachers in Murfreesboro, Tennessee. What a wonderful group of teachers. Actually, I find that same quality in most groups of early childhood teachers. They really are the best human beings around. They are nurturing, caring and work very hard with little compensation. Lack of proper pay alone tells you of their commitment to children. I know there are a few deadheads in the profession, but overall I am so happy that our children are in the care of such wonderful people. It makes you wonder how fantastic our classrooms would be if there was enough money for adequate compensation and plenty for classroom materials. We might just have the best educated children on the planet. It would be a wonder to see what the combination of love and resources could do!